Climate commissioner Connie Hedegaard said that, given the economic climate, the 40% target was a significant advance. "A 40% emissions reduction is the most cost-effective target for the EU and it takes account of our global responsibility," she said. "If all other regions were equally ambitious about tackling climate change, the world would be in significantly better shape." Officials emphasised that the 40% target would have to be achieved "through domestic measures alone", meaning that member states couldn't offset their reductions by paying for carbon cutting in other countries. 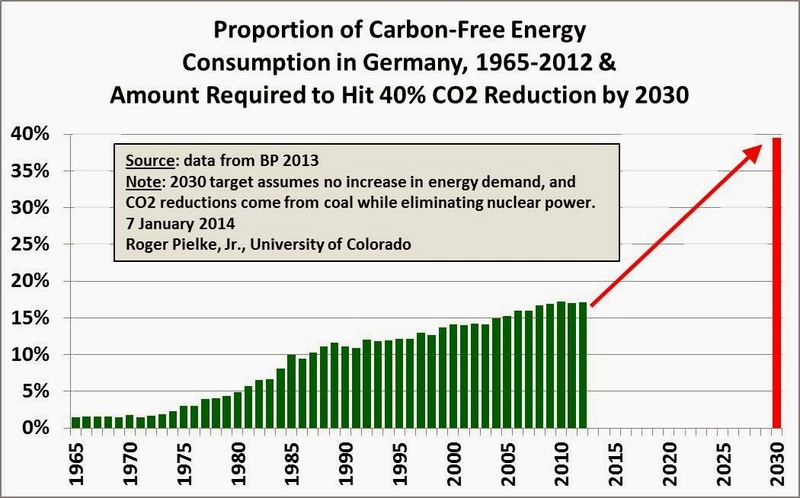 The graph at the top of this post, which I earlier shared via Twitter and is of the sort that I have shown previously, shows the implications of a 40% emissions target for the proportion of carbon-free energy in Germany in 2030. The graph assumes that (a) carbon-free energy replaces the most carbon-intensive sources (i.e., coal), (b) that nuclear is phased out and (c) that energy demand remains constant at 2012 levels to 2030. Such assumptions could of course be varied, the data come from BP 2013 Statistical Review of World Energy.